FQB "Idyllic" Collection embodies that feeling of contentment, peace and beauty all captured in a coordinated kit. Creating is so easy with the wonderful elements and background papers of this digital kit! 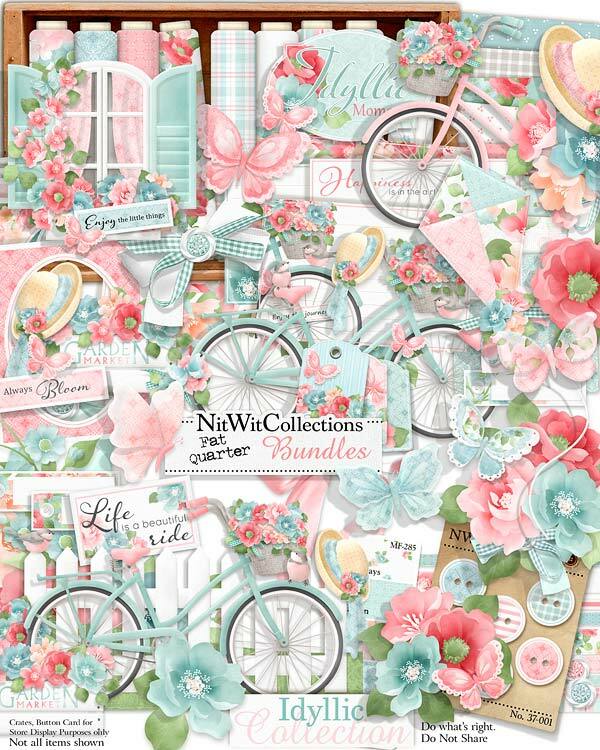 Soothing pink and teal tones of the papers and the butterflies, window scene, bicycle, hat and journal cards all give you so many imaginative options that you will want to create multiple cards, mini albums and scrapbook layouts with this kit. Feast your eyes as you scroll through this Collection and we are sure that you will find legions of inspiration. 1 Corner cluster of flowers that will dazzle you....and your creations! 3 Flower clusters in different settings and combinations...which one works best for your vision?? 2 Hats...now these are digital, but wouldn't you love one just like it in real life?? 4 Lined journal mats that are the perfect digital accent to personalize your cards, scrapbook layouts and mini albums with. 1 Kite to help your creations "soar"! 1 Label - "Life is a Beautiful Ride"
1 Title element - "Idyllic Moments"